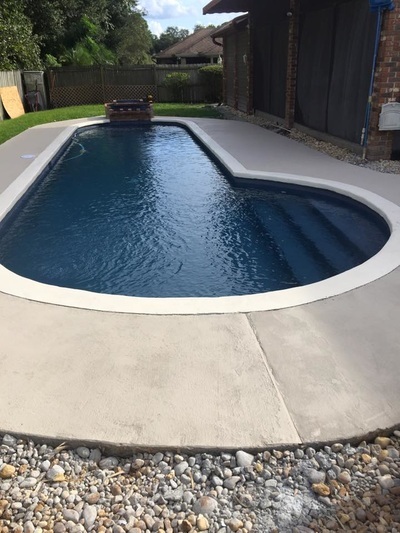 We bring the future of pool resurfacing & remodeling with Aquabrite & Polyfibro, only company in Orlando with Fiberglass Pool Finishes which is longer lasting, more weather resistant & looks better than traditional concrete & plaster pool coating options. 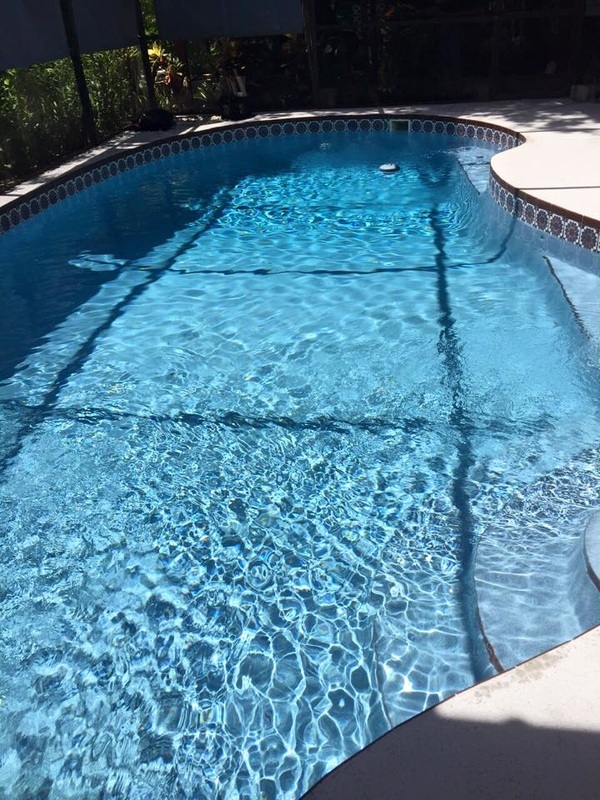 We have over 15 years of experience in pool repair & maintenance work, that has given us very deep understanding of which pool surfaces works best for Florida's weather. This is what caused us to find the ideal product that is the very best in durability & aesthetics, it encompasses the benefits of new age fiberglass material from Aquabrite & Polyfibro, our pool resurface gives you that beautiful deep blue finish of your dreams at 1/4 the cost of traditional concrete and it is also extremely resistant to wear & corrosion, inhibit algae growth and bring savings in chemical costs. We give FREE estimates, so call us today. Proudly serving surrounding cities of Orlando including WIndermere, Winter Park, Altamonte Springs, Kissimmee, Pine Hills, Meadow Woods, Apopka FL & most of Orange County Florida. 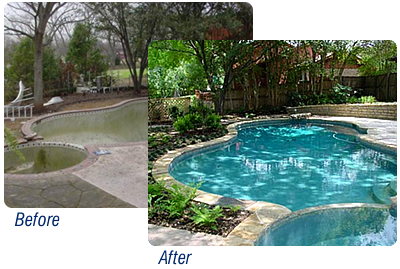 Why people choose us over other Pool Resurface Companies? If you've been searching for a pool resurfacing contractor, pool excavations, or pool remodeling, Blue Light Pool Finishes offers the only fiber glass surfacing option in Orlando with high performance EcoFinish and extremely durable aquaBright. It is simply the best surfacing option for your pools on the market today. With 15 years of collective experience here at Blue Light, we are recognized as pool surface maintenance experts. Because of our longevity we give our best recommendations according to necessity and budget for our customers. Here in Florida we are able to spot many potential issues caused by Florida climate, water hardness and the environment. Our fiber glass options offer cost effective measures to protect your pools and bring back its beauty with deep blue finishes. Blue Lagoon, Blue Granite, French Gray, Kona Coast, Gray Reef, Sahara Sand and others. We use modern day technology such as "Aquabrite" and "Polyfibro" for pool surface care. Several of our customers who have coated their pools with AquaBright report having saved up to a whooping 40% annually on chemical usage. So not only are you saving money maintaining your pool, you're freeing up your time to enjoy your pool with family and friends more often. aquaBRIGHT technology allows for less harmful chemical use for safer swimming. Chemical reactions between water and cementitious surfaces responsible for fluctuating pH levels are reduced drastically with aquaBRIGHT. Unlike conventional pool remodeling technology, aquaBRIGHT safely coats cementitious surfaces providing a protective covering' over the base. This prevents chemicals put in the water from chemically reacting negatively to the pool surface area. 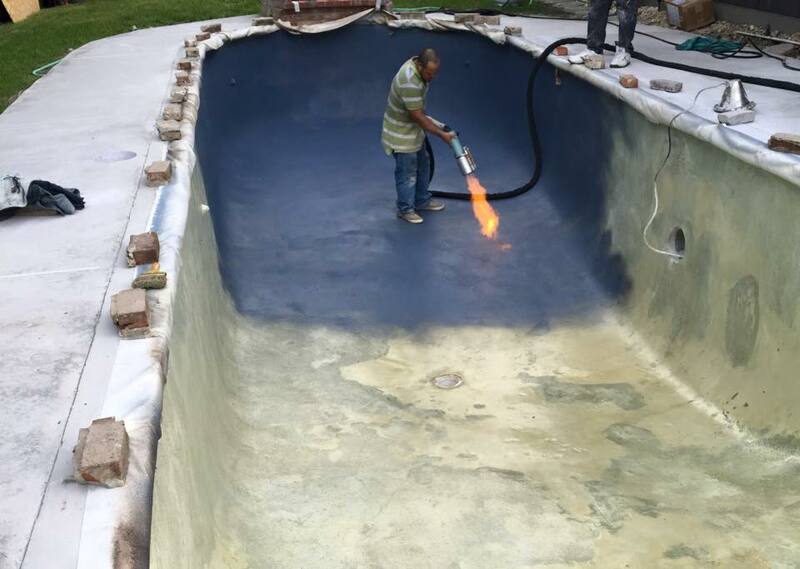 During pool surface repair, small cracks are filled in and covered by aquaBRIGHT. Larger cracks, including structural cracking are repaired by industry accepted epoxy injections, hydraulic cement and/or staples, and then coated over during aquaBRIGHT installation. Due to the flexibility of the finish, it adapts by stretching and pulling without ever tearing or breaking. Before the pool resurface process, we prepare your pool surface first by emptying all contents including water, debris, leaves, dirt, algea, etc. 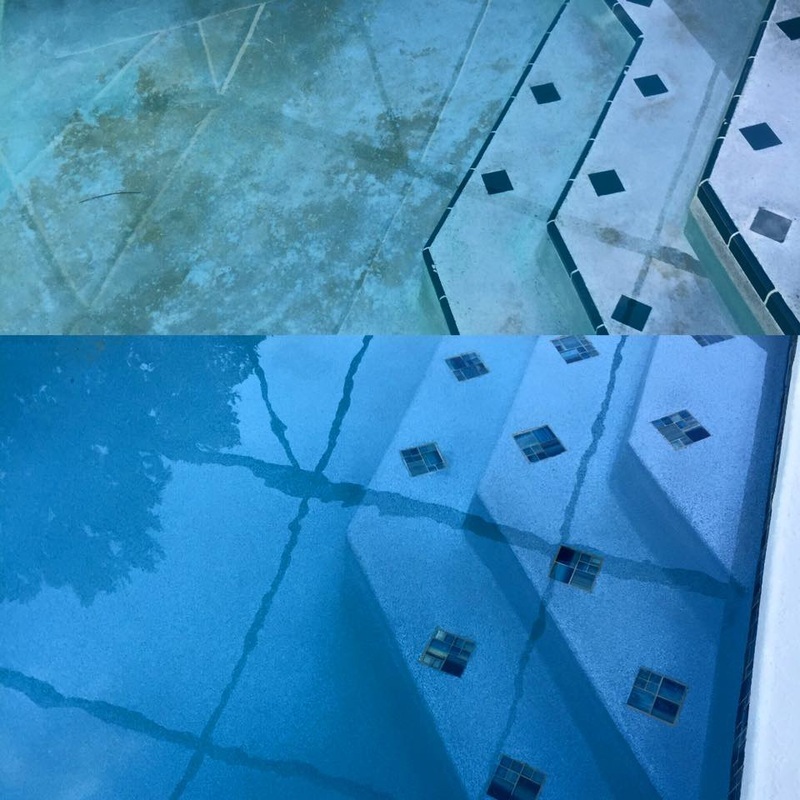 Secondly, we power wash clean the entire pool and/or spa surface to remove all minerals, calcium build-up and other contaminants on the substrate. Next, we inspect the substrate to ensure the plastic or cements has no visible cracks or imperfections and that all hollow areas have been patched. Fourth, to protect water line tile, trim tile and coping, a silicon coated tape and masking fabric should be applied prior to rolling out the epoxy. Fifth, the epoxy is required to adhere the thermal plastic powder to the surface. Then the epoxy is rolled out over the entire pool and spa shell. Sixth, thermal poxy spray equipment is used to pneumatically apply the powder into the tacky epoxy. As the epoxy cures around the process thermal plastic powder, the two creates a permanent bond. Seventh, we apply the final installation called top coat. It reveals a uniform color consistency and a smooth texture during this process. And lastly, the pool can now be filled either immediately or gradually with the new aquaBRIGHT finish. Congratulations! You now have a rich, vibrant and durable finish that will last for many years. From here on, you no longer need any harsh, start-up chemicals. Just balance the pH levels, and swim! Let's face it. Maintaining a pool is a headache. And the larger its size, the bigger the potential problems such as staining, cracking and pre-mature aging. 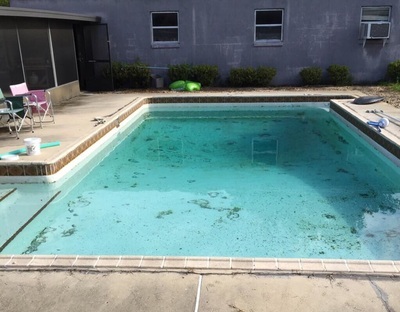 Fortunately, aquaBRIGHT pool surface repair technology is resistant to blistering, chalking, peeling, cracking, and other signs of deterioration. The material used is a fine powdered formula that, when it strikes the pools surface, it instantly evens out. This flattening process forms a thin, hard layer of resin impenetrable to algae, calcium or other staining agents. Most all discoloration that would normally cause staining in non-treated pools easily wipe off with aquaBRIGHT. As for its crack-resistence, it is remarkably strong yet flexible and expandable up to 200% of its original form before it tears, break or ruptures. Even under the most extreme circumstances, this is unlikely to happen because we tested this under the most bitter cold temperatures. There was a test we performed in one of the coldest climates in the world next to Alaska – Ontario, Canada; where temperatures drop as low as 40 degrees BELOW zero. Over an extensive period of time there were no signs of wear, tear or negative effects from the extreme bitter temperatures even when applied to two steel pool wall panels bolted together. There was no cracking, breaking or tearing even over the joined seam panels where it could cause the most damage. 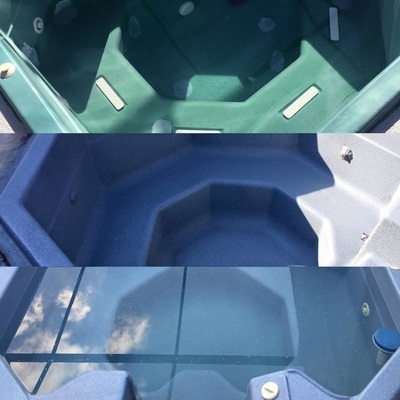 Recently, an owner of a winterized pool in Northeast America purchased a new winter cover. To his surprise it was installed in the wrong color. It took months for the supplier to send a technician to replace and install a another cover. By then the existing cover had rain water, debris and other leaves gathering on top. The technician responsible for replacing the pool cover for a new one made a faux paus. He did not bother pumping out the contamination from the cover top. 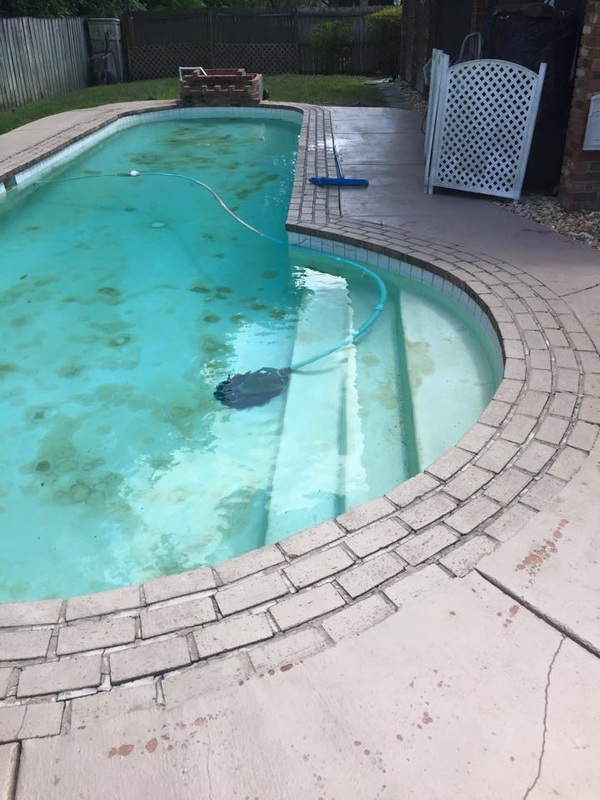 Instead, like pulling a rug from underneath someone's feet causing them to fall, all the dirt, debris and gunk consequently fell into the pool water. Unknowingly to the owner the technician went forward with installing a new cover preventing the owner from ever knowing nor seeing the mishap until 3 months later when he discovered this unpleasant surprise. Upon removing the cover for Spring, what lied underneath was a pool filled to the brim with disgusting brown sludge so thick you couldn't see your own reflection. It was equivalent to a pool full of pudding. Fast-forward and the pool owner undergoes a 3-day process of pumping out all contaminated water and leftover debris. AFter this deep cleansing it became obvious the entire aquaBRIGHT surface from the waterline down had a dark brown tint coloring that brushing alone could not remove. But there's a happy ending. EcoFinish advised using Ascorbic Acid powder (or Vitamin C) for the pool walls. What happened next brought relief to the pool owner. Within *minutes* the aquaBRIGHT finish was as clean as when we first installed the coating. It was restored back to its' original brilliance with no harm done. 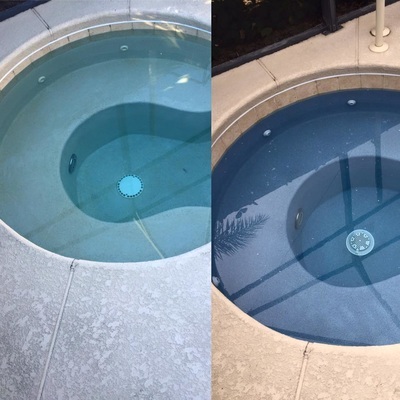 Without aquaBRIGHT it would have cost him thousands for an entire pool renovation including the cleaning of the cementitious surface area of the pool. Here at Blue Light Pool Finishes It pays to have a peace of mind. Recently, we performed a basic test using a gallon of Muriatic pool acid. We poured it onto an AquaBright finish while it sat for 10 minutes. After rinsing off the acid there was no visible signs of acid ever being there in the first place. aquaBRIGHT is created using the same material found in the very jugs that store the chemicals to be used in pool water. This resin is found in the same base polymer family. 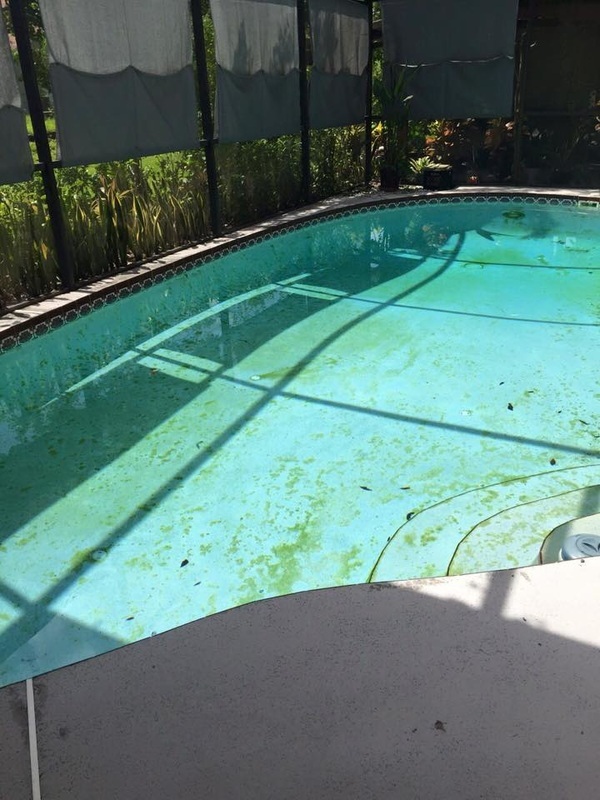 We've discovered the major issue with standard levels of pool care is that the pH levels tend to drift rapidly. With aquaBRIGHT the task of maintaining pH levels becomes very easy to do. Adding chemicals becomes simpler, since now there is no reason to pre-dilute the acid by mixing with water prior to pouring into the pool. Just pour it straight in without hassle. If you were to compare our warranty to most pool remodel companies, you'll find we stand behind our products and service 100%, no questions asked. For example, customers typically are expeceted to shoulder the burden of responsibility leaving the pool resurfacers with little more than a slap on the wrist if the fault lies on the pool resurfacer. Standard warranties leaves a lot of the responsibility on the customer while conveniently removing accountability from the pool resurfacer. Thus, if anything were to go wrong, it's because the customer failed to maintain detailed records proving consistent maintenance. It can also be argued that water chemistry and PH levels are 'off balance' from failure to keep meticulous records, causing the warranty to be practically useless. This stress is heightened when you consider most pool surface repair companies use a cementitious finish known to deteriorate from even the best water treatment care rapidly. With this understanding, honoring a warranty is little more than a token gesture while simultaneously sticking you with costly repairs. What makes our signature pool finisher 'aquaBright' unique is, under these normal conditions in pool chemistry, you're pool water will not have a negative affect on your professional finish. So your pool lasts longer, better. Our warranty includes: Chemical resistance, Chalking resistance, preventing mildew growth, crack resistence, spall and delamination resistance, stain (organic) resistance. 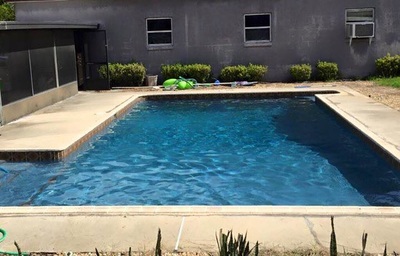 Here at Blue Light our team of dedicated team members are dedicated to giving you the best pool renovation at affordable and reasonable rates.